Operating profit margins of tyre manufacturers are likely to record steady growth over the next couple of years due to a recovery in original and replacement demand from the auto industry. Tyre companies' operating margins remained subdued during the April-June quarter of the financial year 2017-18 due to destocking by the stockists ahead of GST (Goods And Services Tax) implementation effective July 1. Stockists cleared their inventory amid fear of GST levy on the carryover stocks beyond July 1 without input credit. Normally, tyre demand remains weak during April-June quarter following subdued auto sales in rural India as farmers prepare for planting of kharif crop ahead of the monsoon rainfalls. This year, however, tyre demand remained exceptionally weak as stockists retuned their stocks to manufacturers to avoid GST levy. 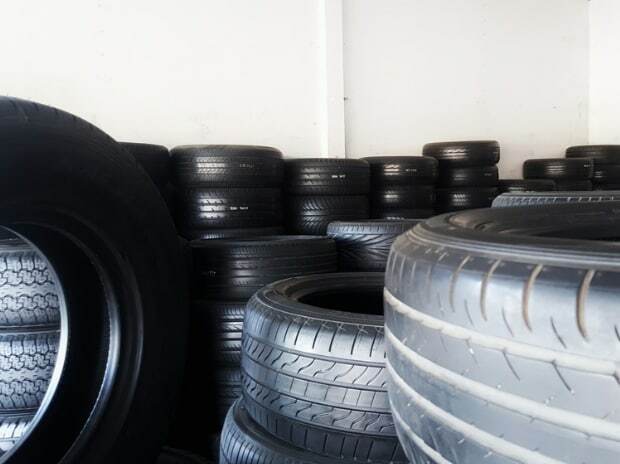 "Overall demand for tyres is expected to pick up and see a growth for 7-9 per cent, with original equipment manufacturer demand likely to grow in the region of 8-10 per cent and replacement demand to see 6-8 per cent growth. The growth in tyre demand is expected to bring operating leverage benefits to tyre manufacturers. However, higher raw material costs would eat into gains. Growing competitive pressures would limit passing of higher raw material costs onto consumers. 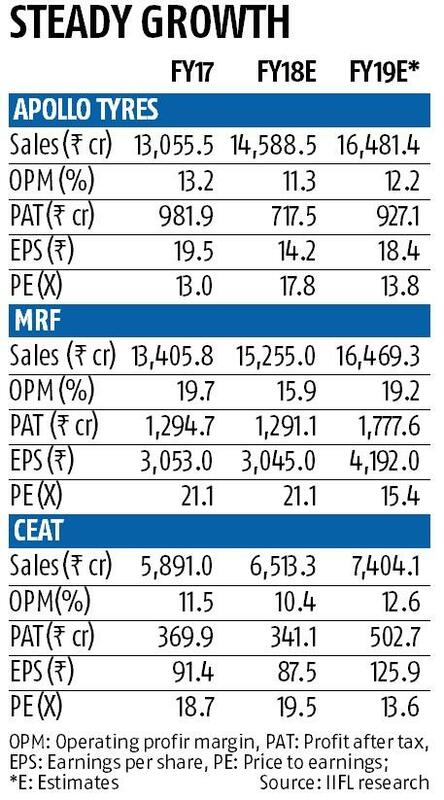 Consequently, we expect operating margins for tyre manufacturers to witness steady growth over the next couple of years," said Amar Ambani, Head of Research, India Infoline Wealth Management Ltd.
Ambani forecast operating profit margins of Ceat to remain at 12.6 per cent for the financial year 2018-19, an increase from the estimates of 10.4 for FY 2018. The leading tyre manufacturer posted operating profit margins at 11.5 per cent for FY2017. Similarly, the operating profit margin of Apollo Tyres and MRF is forecast at 12.2 per cent and 19.2 per cent for FY2019, an increase from 11.3 per cent and 15.9 per cent for FY18 respectively. Meanwhile, domestic tyre manufacturers are also likely to reap benefit for the recommended anti dumping duty of $245-452 per tonne on truck and bus radial tyres imported from China, potentially minimising the threat of market share loss to cheaper radial tyres. The increase in anti dumping duty would correspond to 10-15 per cent increase in landed cost for Chinese tree born rubber (TBR) tyres. "The imposition of anti dumping duty on truck and bus radial tyres imported from China could be a positive for the industry grappling with rampant import for Chinese tyres at uncompetitive prices. Coupled with GST, the duty could largely eliminate the price differential between the landed price of Chinese tyres and locally produced tyres leading to a reduction in imported Chinese tyres (currently to the tune of 15-20 per cent)," said Nishant Vass, an analyst with ICICI Securities. Rajiv Budhraja, Secretary General of Automotive Tyre Manufacturers' Association (ATMA) believes that auto demand would drive tyre consumption this year especially from rural India due to bumper agri output this kharif season following normal monsoon. Seasonally, the second half remains better than the first half for tyre manufacturers, he added. "The demand for automobiles usually starts picking up in Q2 and gains momentum in Q3 during the festival season. Also, demand remains strong in February and March. In FY18, we expected automobiles to witness pick-up in demand post the initial interruptions caused by GST implementation and marginal price adjustments. Also, demand is expected to improve on back of various initiatives taken by the government in the Union Budget 2018. Reduction in tax burden for individuals with income below Rs 500,000 is likely to have positive impact on the two-wheelers and cars demand. Also, improved consumer sentiments post the normal monsoon and Seventh Pay Commission is expected to boost the demand," said Madan Sabnavis, Chief Economist, CARE Ratings. Budhraja, however, cautioned that prices of raw materials including natural and synthetic rubber and crude oil have started moving up. A sustained increase in the raw material prices may, however, eat away some profit margins of tyre manufacturers, he added.